Take a look at the latest figures brought to you exclusively by Frothers Unite! UK. Remember that none of these fantastic figures would even exist without the Frother Community and then recall that every sale helps pay for us to pour scorn on other miniatures from around the world, made by people whose livelihood depends on selling lead figures. You too can join the fun on our incredibly expensive (but free to you) froth forums! Its easy to buy an FU!UK miniatures pack... just click on a 'BUY IT!' button next to a picture of the product you want- if you don't have a Paypal account you can easily create one from there. You can also click on the picture or title to see more pictures of the figures and order from there. Anyone interested in ordering large number of figures from us (more than £50 worth) should instead contact us using our shop enquiries email and we'll see if we can cut you a deal (and if we don't reply within 2 minutes please don't complain to TMP... seriously we don't do this for a living or anything). Our very own Colonel M, his legend already assured, is immortalised in this miniature by Shane Hoyle. Perfect for modern and victorian gaming, the Colonel can be used as the haughty lord of the manor, the out-of-touch newspaper editor or the eccentric colonial adventurer. Maybe even as the retired army officer! This unique figure is 26mm short (and about the same around) and can be yours for only two and a half of the Queen's own 'pounds', or any other money you can convince Paypal actually exists! Yes, hes still available, the famous FU!UK Orc, sculpted by frother friend Seth "waxfive" Nash and donated to the twin causes of supporting this site and cleaving Elf skulls! This unique and beefy armoured Orc champion standing at 34mm with plate armour and BIG axe can be yours for only 4 gold nuggets (aka Pounds Sterling)! 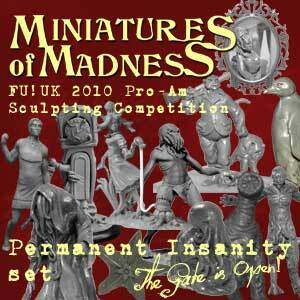 The 2010 Miniatures of Madness: Permanent Insanity (The Gate is Open!) set, comprised all 7 winners and 5 selected runners up from the Frothers Unite! 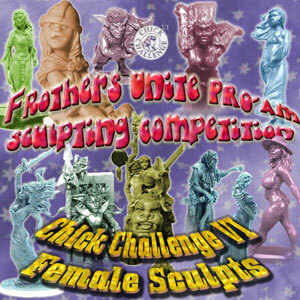 UK 2010 Pro-Am Sculpting Competition and was available from 7 March to 6 May 2011. 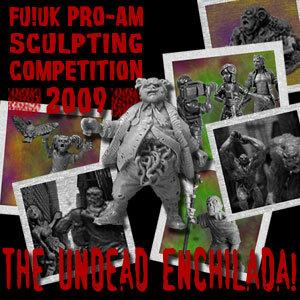 "The 2010 Sculpting Competition - Permanent Insanity Set"
The 2009 FU!UK Sculpting Competition Undead Enchilda Set! 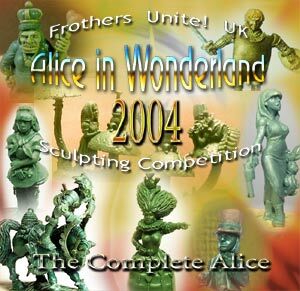 This thrilling collection of the winners and runners up in the fifth Pro-Am Sculpting Competition, was available from 3 November 2009 to 2 January 2010. It also included a new Colonel Marbles figure by Sylvain Quirion - Zombie Colonel! 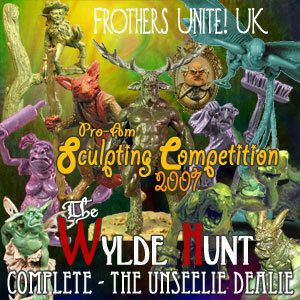 "2009 Sculpting Competition - The Undead Enchilda Set"
The Wylde Hunt figure sets were produced from the Frothers Unite! UK 2007 Pro-Am Sculpting Competition and available from 1st - 31st May 2008. The theme was fae, goblins and other creatures of myth, and purchases included a free PDF game themed to the competition, from Woteva Games. Frothers Unite! UK's third Pro-Am Sculpting Competition, which had a pulp horror theme! As well as being great for pulp gamers and collectors, all of these figures were included as characters in the amazing "Escape the Aylum" boardgame from Woteva Games, which was sent as a PDF to everyone ordering a set of the figures! The What Women Want figure sets were produced from the Frothers Unite! UK 2005 Pro-Am Sculpting Competition and made available from 21st Nov 2005 - 20th Jan 2006. The What Women Want Winners Set, comprised the winners of all four categories in the competition. The What Women Want Too Set, contained the judges' choices from every category of the competition. * Assuming those women are the four eminent miniature painters we asked to judge the competition. The Complete Alice set is no longer available to order, as our loan period on the winning sculpts is over and the rights have been returned to the sculptors. Thanks to everyone who took part, and everyone who bought a set! Keep your eyes out for the next competition, and froth on! Any queries relating to the frother shopping channel should be referred to shop enquiries. FU!UK is not responsible for any acts of grand larceny carried out through its web site. I hope.